Sold out show this afternoon @la_carnita today! Can't believe I had beef cheeks, blue berries and bone marrow in a taco. Insane! May slip in a food coma soon. Thank you to all those who made it today making it an amazing afternoon! Especially those who waited in line, and were stuck outside under the blistering sun. Thank you for your support and patience! Good thing that they were giving out free water bottles at outside of Totem Fitness next door. What a great turn out! I remember seeing the line up go out on the street, right up to Brassaii restaurant (on King West). I also want to thank Amin Todai and Andrew Richmond for letting me do this. It was great to meet the amazing team at One Method Inc. and the volunteers as well. Hope to see you soon. 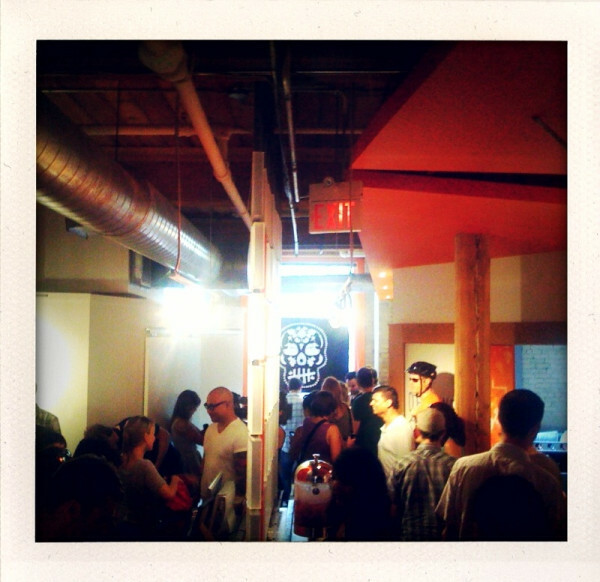 I'd like to also thank Clay @ Spoke, for inviting me out to the first taco session! For those of you who weren't able to make it today, not to worry. It will happen again soon with another artist and another super chef. Sign up for the newsletter (right column) for updates! Until the next one event, stay cool Toronto. Oh, and more photos to come, so stay tuned! ps: did anybody catch the CBC coverage on the event broadcasted at 5pm today? Video of CBC coverage of the event is here! Scroll to the 25:00 mark!